All the edges in the Cube has same length. OR We can say, Cube is nothing but 6 equal squares. This python program allows user to enter any side of a Cube. 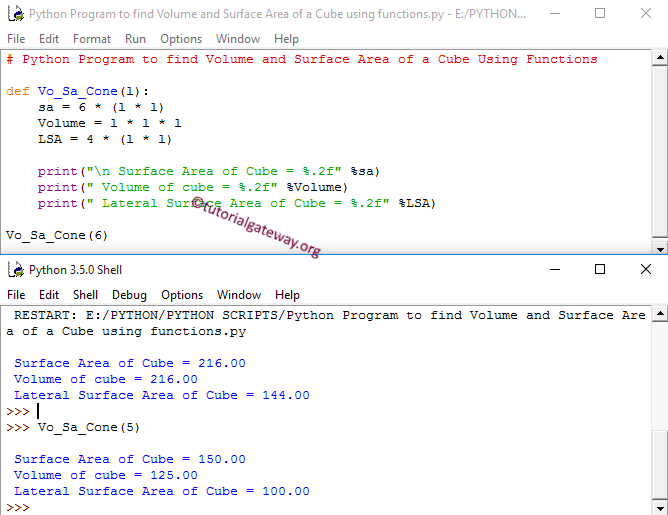 Using this value, this Python program will calculate the Surface Area of a cube, Volume of a cube and Lateral Surface Area of a Cube as per the formulas. Below statements will ask the user to enter the length value and it will assign the user input values to respected variable. This program allows user to enter any side of a Cube. We will pass the value to the function argument and then it will calculate the Surface Area of a Cube, Lateral Surface Area of a Cube and Volume of a Cube as per the formula.